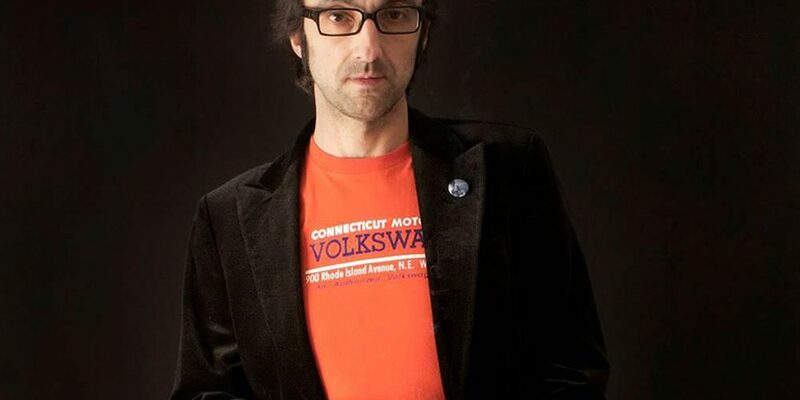 Agustín Fernández Mallo, Nocilla Lab. If you’re an artist aiming for nothing less than capturing the zeitgeist, you’d do best not to try writing a novel. When it comes to putting your finger on the pulse of our times and creating something that encapsulates the present, the novel is an anachronistic artform. Our times are breathtakingly fast. Writing is grindingly, painstakingly slow. Our times are visual; words are abstractions. Our times are digital; books are analogue. Our times are characterised by distraction. Reading requires sustained concentration. Most damning of all, our times are enamoured of ephemeral entertainments — fragmentary and transient amusements that burst before us like fireworks and dissipate just as quickly — while the novel is wedded to an ideal of artistic longevity, even immortality. How can a novel capture the zeitgeist if the properties of its form are so at odds with the textures of the now? But maybe I’m getting ahead of myself. I’m certainly making some assumptions. Early in the New Year, I saw my shortcomings flash before my eyes as two events in my life coincided with complementary effects, though they should’ve been contrapuntal. 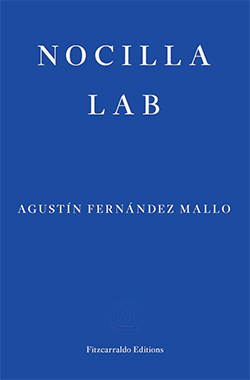 The first event was the traditionally literary one: I read Agustín Fernández Mallo’s Nocilla Lab (trans. Thomas Bunstead), the final volume in a trilogy of novels known as the Nocilla Project. The second event was the one more typical of life in 2019: I was toying with my phone, despite my resolution to activate screentime limitations, scrolling through my Facebook feed, despite my resolution to delete my account, when I found my attention arrested by a meme. Permit me this digression. I promise you it’s on point. The meme was a video clip that began with a close-up shot of a smiling woman, lying on a patch of grass. The video zoomed out to show the woman on the grounds of Google HQ in Silicon Valley, then zoomed out further to reveal the state of California, and zoomed out further still to survey the United States, North America, the northern hemisphere, the whole of our planet, and so on, continually receding in order to encompass the moon, the solar system, asteroids, the Oort Cloud, Alpha Centauri, interstellar systems, the entire Milky Way, our neighbouring galaxies, our local supercluster, the cosmic web (whatever that is) and finally the universe. Then, like an elastic band stretched too wide and snapping back to its proper dimensions, the movement changed direction and the video zoomed in again, down through the supercluster and the galaxy neighbourhood and the Milky Way, down through the clouds, the space debris, the solar system, all the way down to Earth and North America and California and finally the woman at Google HQ — but then, to my surprise, it didn’t stop. It kept going, drilling down into the imperceptible substrata of our world. Down it went, zooming in on her eye, then down into her pupil, her retina, her blood vessels, cells, chromosomes, DNA, polymers, atoms, electrons, into the terrifying space known as “atomic emptiness”, into the nucleus, the protons and neutrons, and, at last, down towards the quarks that are the stuff of reality at the subatomic level. It’s useful to be reminded of human scale from time to time — to refresh one’s awareness of the relative position of human affairs in a scheme of existence so vast that its macro and micro manifestations escape our notice. The reminder is useful in a general sense, in the sense that feeds into those New Year’s resolutions to keep things in perspective, but it’s especially useful for those who see themselves as “cultured” people with a clear understanding of the zeitgeist. I’m one of them; I don’t deny it. I have a background in the humanities and a career at the intersection of public policy and the social sciences. I belong proudly to the metropolitan élite. I like to think I know what’s going on out there. I like to believe I can make more sense of it than most. When I say that our times are fast, visual, digital, distractive, and ephemeral, I’m trying to find the best words for a succinct definition of the world I see around me. But then, of course, in settling on these words, I’m encoding my own background into the worldview I’ve articulated. By this I don’t mean I’m encoding my privileges, although they’re in the mix as well. I mean that my view of the world, from top to bottom, from my self-hating relationship with Facebook to my need to pre-emptively acknowledge my advantages, is primarily conditioned by my personal investment in the liberal arts. I know it would be somewhat different if I were an immigrant, or gender fluid, or a welfare claimant, and I often guess at the ways in which it would alter under altered circumstances. But what if I were to extract the liberal arts from my life, root and branch, and exchange that part of my background for a fluency in the sciences? I’d be subjecting myself to a radical reconfiguration of my understanding of the world — including, firstly, a more acute awareness of its scope, of the largeness and the smallness of its fabric at both extremities of our human scale. What does the zeitgeist look like to a person whose orientation towards the world is informed by science rather than the arts? Not a person with a slightly different mixture of scientific and artistic awareness, not someone who dabbles fairly in both fields. What does the zeitgeist look like to someone for whom the latest discoveries of science compound into the very bedrock of a worldview? Forget about social media, data harvesting, wearable tech and the like. Think quantum physics, dark matter, spooky action, string theory. How does the now change appearance if one allows one’s sense of reality to be shaped by these concepts and their implications? And how would a novel be inclined to behave — what strange form would it be likely to take — if one were to seek to capture in its pages this alternative conception of the now? Forgive me the unwieldy preface, but I can think of no other way to begin reckoning with the sheer oddity of Nocilla Lab. It’s not just an odd novel by most standards, nor even by the standards of novels that shun the conventions of literature. It’s an odd novel by the standards of its predecessors, the first two entries in the Nocilla Project, which are odd in themselves. In fact, Nocilla Lab is doubly odd because it enacts a decisive break with the form of both Nocilla Dream (2015) and Nocilla Experience (2018) while also supplying them with a coherent ending of the sort they seemed poised to lack. I’m not sure exactly how I feel about it, except that I’m sure it feels right, in spite of its staggering diversion from my expectations based on the trilogy to date. is that the writer must be realist, always realist, but not realist in the sense we have usually used the term in literature. If reality today is different from the reality of thirty years ago, we can’t keep describing reality in the same way as we did thirty years ago. Today we understand that reality corresponds to a model — or, even better, the sum of various models — which in science are termed “complex systems”. … This complexity is what creates that which we all know — the World — is connected in a system of networks — and I’m not referring only to the internet but also to thousands of analog networks in which we are all immersed at every instant. … These networks are in everything: the way in which an ant is connected to an elephant in the chain of being, or the way in which a person is connected with his or her friends, the way in which our neurons are connected in the brain, the way in which nodes are connected in the internet, etc. all follow the same network model. His novels, he adds, “are realist because they talk about my time, my epoch, but they do so in a complex mode; that is to say, they’re taking into account the reality that surrounds me.” This makes the strange situation look rather more straightforward: Fernández Mallo is principally a scientist, with a scientist’s view of the now, and he has written the Nocilla novels in such a way that they reflect the now through the peculiarities of their form. Nocilla Dream and Nocilla Experience share a similar design. Both are composed of very short chapters, a couple of pages in length, which depict disconnected episodes in a selection of loosely related narratives. At the centre of Nocilla Dream is a lone tree in the Nevada desert, bedecked with dozens of pairs of shoes like a piece of avant-garde art. Around this tree a wide cast of characters revolves, ranging from an obsessive devotee of the history of so-called “micronations” to a man condemned to live in an airport, with no overarching narrative to unite them. Interspersing the chapters are quotations from interviews with various historical figures, some of them obscure, some better-known, and the text as a whole is peppered with a variety of fragmented documents: an invisible poem, a list of physical constants (“Solar Mass = 1.989E30 kg”), a treatment for a screenplay in Courier font. Nocilla Experience adopts much the same form — short chapters, no overarching narrative, quotations, pastiche — although it is more conspicuously decentred, lacking a unifying image or concept such as the tree of shoes. Collage is the driving force of these two books, the basis of their shared aesthetic. They are made of a combination of original materials and materials found, salvaged, repurposed. Each shred is thrown at a canvas and pressed down amongst the others, giving rise to a cacophony that requires active input from the reader to discern, decipher, and sometimes speculate on the meanings of their interrelationships. Each is like a node in a vast network whose connective fibres must be laid anew, and in different ways, by every person who picks up either one of the novels. When I read Nocilla Dream and Nocilla Experience about a year ago, I thought they did an inventive job of capturing the zeitgeist as I already understood it. In their haphazard flashes of action, in their fondness for fragmented mash-ups, in the brevity of their scenes and the cross-cutting of rapidly proliferating storylines, their form, I thought, reflected the whirlwind of life today: distractive, ephemeral, and all the rest. But I see now that I was still reading the novels through the lens of my liberal arts worldview. Nocilla Lab seized that lens and smashed it. The third volume of the trilogy also plays with collage and fragmentation and mash-ups, albeit in different ways to the first two and with different effects. It also does away with the dozens of short chapters, instead breaking down into four distinct parts. It opens with a single run-on sentence, seventy pages in length. Then it moves into autofictional mode as a first-person narrator named Agustín Fernández Mallo tells a disconcerting story intercut with captioned photographs. 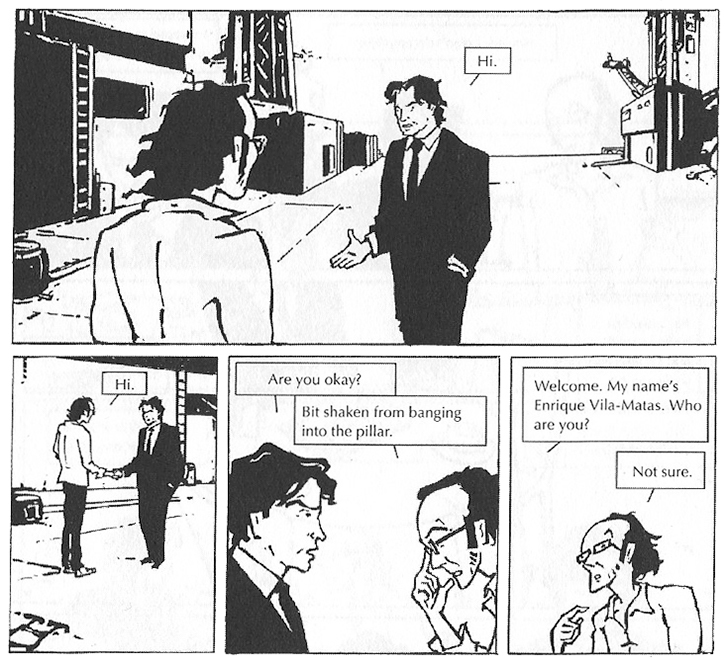 This section is followed by a typescript of a confession written by the same Fernández Mallo, which also weaves in shards of poetry, and thereafter the novel concludes with a comic strip whose protagonist is a version of Fernández Mallo — or maybe a new version of one of the earlier versions of Fernández Mallo. Daring to pull off a stylistic switcheroo to this extent is an impressive feat on the part of the author, but it’s downright heroic for his translator, Thomas Bunstead, to match his moves; the sudden gearshifts between the sections feel like translation’s equivalent of a racing car driver mastering successive hairpin turns at 180 degrees. Bunstead’s skill is even more evident in light of the absence of any conventionally representational language in Nocilla Lab, and the stylistic extremism of Nocilla Lab relative to the attenuated language of Nocilla Dream and Nocilla Experience. It makes for an impressive demonstration of linguistic dexterity. Could there be a more strident rejection of the liberal arts worldview? If there’s one thing the arts insist on, it is that each individual is irreducibly unique and therefore possesses an inviolable dignity. Theology, philosophy, and literature all recognise, on principle, the thorny particularities of individual lives, and attempt to relate them to supposedly universal truths or other absolutist concepts. Law and policy originate from the same place, acknowledging at least the distinctive rather than general features of a given person, and history and sociology and contiguous disciplines would be nothing without the presupposition — which is fundamentally an ethical one — that we must conduct our affairs on the basis of a willingness to distinguish between particular cases, to accommodate and account for manifold points of divergence. But Nocilla Lab kicks off with the articulation of an opposing worldview that resonated strongly with the meme I saw in my Facebook feed. If you zoom out far enough from experience on a human scale, all points of divergence amongst different people dissolve into the haze of stardust. If you change direction and zoom in close, subatomic particles that appear identical — and that behave identically despite occupying two distinct points in space — diffuse all differences of ethnicity, gender, age, culture, and more. Here, then, is Nocilla Lab: a novel of the now that assumes a scientific worldview, with an understanding of the zeitgeist defined by recent discoveries in both the cosmic and the subatomic order, and then applies this expansive worldview to events at human scale. How would we behave if we were sincerely to see ourselves as indistinct and indistinguishable from others? How would we interact? What would be likely to capture our attention? And what if we were to remain driven by the meaning-making impulse that is the lodestone of all human cultures? How could we reconcile the meanings we make with the vast and indifferent world we take as a given? Could we reconcile them? In the first part of Nocilla Lab, the narrator and his girlfriend embark upon what they call their “project”, which bears a striking similarity to the Nocilla Project itself. They collect and collate found materials, the flotsam and jetsam of other lives, assembling their hoard into a sort of three-dimensional collage with no clear objective in sight. Eventually, wearying of the project, they lock their materials into a guitar case and haul the lot into the sea. Then, in the second part of Nocilla Lab, the narrator, arrives with his girlfriend at an ecotourism outpost housed in a decommissioned prison. 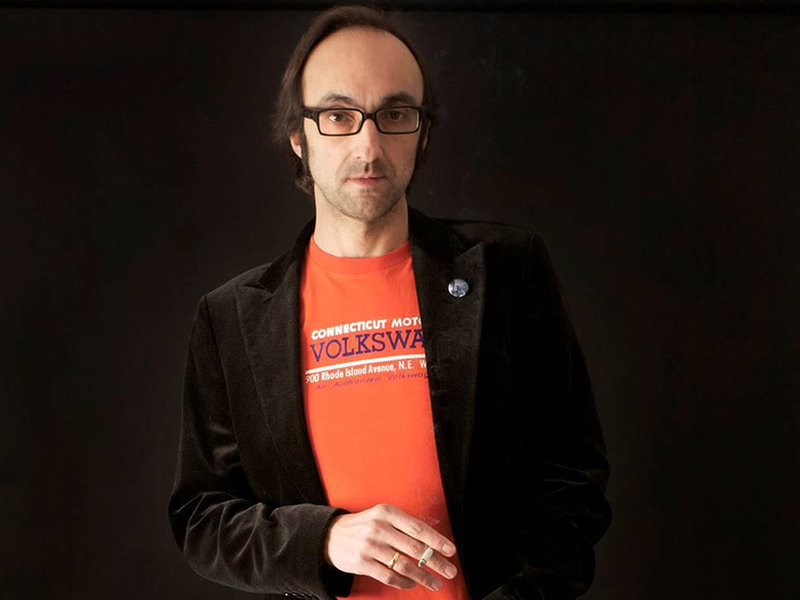 He calls himself Agustín Fernández Mallo and he appears to be the real Agustín Fernández Mallo: he has written a novel called Nocilla Dream, and he quotes extracts of a speech delivered by the real Fernández Mallo. But is reality worth anything here? Soon enough the narrator finds that the man who runs the ecotourism site is also called Agustín Fernández Mallo. Moreover, this man believes the narrator to be some sort of stalker, a would-be impostor, even though he stumbles upon the narrator’s guitar case, recovers it from the waves, and embarks upon revitalising the narrator’s project. In fact, this second version of Fernández Mallo is so intent on continuing the narrator’s collagist activities that he even begins writing the first section of the novel, which has apparently already been narrated by the first Fernández Mallo. The two characters combine to create a literary Möbius strip, and many readers won’t be surprised to learn that Paul Auster’s The Music of Chance (1990) plays a vital role in the narrator’s arrival at his destination. Are we supposed to ask which Agustín Fernández Mallo is the “real” Agustín Fernández Mallo? Or which of two is closest to the real Fernández Mallo, the author of the novel? Is their situation a commentary on the potential multiplicity of identity, in the vein of Auster or David Lynch, whereby two people can be the same person and one can split into two? Or is it, rather, a test of the reader’s ability to internalise the narrator’s outlook? It seems to me to be issuing a dare, challenging readers to fully take onboard the notion that two or more people may be identical, or at least indistinguishable, and that this may not be a problem to resolve but simply the way of the world. Do we rise to the challenge or do we fold? and even on occasion woke up convinced that I had no identity, that I was the imposter, or, like in some cheap, straight-to-DVD movie, that it had all been a dream and since the day I’d been born I’d been dreaming his life, Agustín’s life. Gradually, and without realizing it at first, any time he came to mind that was how I started thinking of him, as ‘Agustín’ — I began to designate myself as ‘I’, nothing more. At issue is the propriety of an individual identity in a zero-sum tussle between two people with an equal claim to it, their equality depending on the flattening of distinctions that is made possible by the scientific worldview. But what happens when propriety becomes this type of issue, when identity is reduced to a mere “designation”? What happens when this issue arises not as a crude conceit in a pulp thriller about identity theft, but as an intractable philosophical problem that gives each version of Fernández Mallo permission to behave towards the other as he would behave towards himself? What happens is that the irresolvable problem of exclusive ownership acts as a spur for ever more extreme forms of interpersonal behaviour. The rising extremism of the two Fernández Mallos is sign and signal of each man’s innate need to make himself distinct from the other — if not by asserting his own distinguishing features, then by obliterating those that overlap with his. So, inevitably, near the end of the novel, the narrator’s inclinations tend toward primal violence, “a primitive act”, and all that is left is one man and one object, or possibly two objects, one or both of which look like a man: “It resembled no known thing or person,” he says of the body, “and neither did I: nothing and no one except myself” — whoever he may be. But the narrator’s violence doesn’t constitute a spectacle or force a rupture with his moral inclinations. On the contrary, although he starts off as a character with an integrated moral framework, he knowingly and systematically disassembles it, replacing its components piece by piece with an amoral structure to guide his interactions with others. In other words, he internalises the concept of the fundamental indistinguishability of people and pursues it from the domain of science into the domain of ethics. As well as applying it to experience at human scale, he follows its human application to its amoral conclusions. What are we supposed to make of this? Do we insist on the distinctions between these men, and distinctions between the same man in different guises? Or do we begin by accepting their indistinctiveness, by taking their fundamental uniformity as a first principle, and going along wherever the novel may lead us? 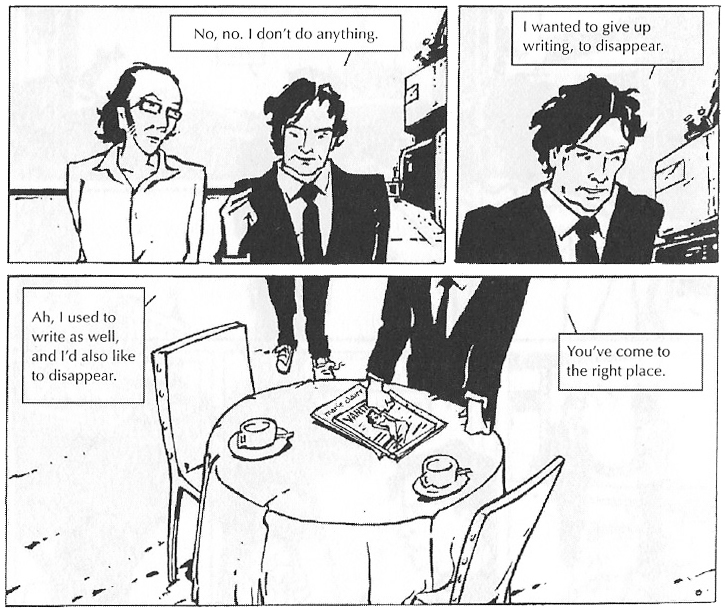 What’s beautiful about Nocilla Lab is the backwash of its linearity: where it leads is back to the beginning, and back to the first two volumes of the Nocilla Project. Nocilla Experience, in particular, is replete with opaque passages about fate, chance, and probability, which make new sense in light of the philosophical paradigm established in Nocilla Lab. It includes several thought experiments involving an unloaded die, hollowed out so that light spills into its core through the holes that represent the numbers, as well as remarks on the likelihood that the equilibrium of chance in the die would become imbalanced because the side with one hole would be heavier than the side with six. Nocilla Experience also describes a problem of logic and semantics involving a “surprise tiger”, a tiger hidden behind one of six doors, and considers the likelihood of a person opening a door at random to find the tiger on the other side. Ultimately, Nocilla Experience suggests that when we are faced with problems of chance — which is to say, decisions of any sort — the best we can do, in the absence of certainty, is take a crap shoot, act dispassionately and on instinct. After all, if we zoom out to broaden our perspective on events, any possible eventuality is approximately as probable as any other, and as time goes on and events accumulate, the significance of each individual event diminishes until it arrives at the zero point of meaning. While Nocilla Lab doesn’t explicate the assumptions underlying the earlier novel’s passages on probability, its amorality and its nihilism do arise from a logic that provides ballast to the earlier novels — to Nocilla Experience with its exhortations to be indifferent to one’s fate, and to Nocilla Dream with its indifferent migration from fragment to fragment, event to event, story to story. It is the book in which the Nocilla Project arrives at an end, but it would also be an excellent place for new readers to step into the trilogy. Beyond that claim, I’m wary of garlanding Nocilla Lab with superlatives. It’s not that kind of book. It doesn’t try to captivate its readers; it won’t sweep you along or cause you to swoon at the fineness of its prose. That’s not to disparage it, but to acknowledge what has already been said of Nocilla Dream and Nocilla Experience and is even more true of this novel: this is a work of literature that really does do something new, something genuinely novel, including rubbishing any preconceived terms on which readers would be poised to evaluate it. It is the literature of a new now— a zeitgeist newly and imperfectly understood, simultaneously relevant to human existence but indifferent to human affairs, from time to time given voice in literature but never given appropriate form until this moment. I can’t simply say that I like it, because I don’t think it’s there to be liked. I can say, however, that it has shaken me, upsetting my predilections and preconceptions, and it has forced a shift in my habits of thought. Zoom out, zoom in, zoom out, zoom in: like an elastic band stretched too wide and snapping back to its proper dimensions. Nocilla Lab gives the Nocilla Project the zoom-in that it lacked until now, and the whiplash is enough to do lasting damage to those unprepared for the sudden change of view. So here’s what I’m left to wonder. Why bother asking whether or not the novel can any longer capture the times we live in? The question itself is outdated. We have in front of us the novel that has captured them. The real question is: can we, as readers, change tack fast enough to grasp what it is showing us? MacKenzie Warren read English at Oriel College, Oxford. She now lives in Bristol where she works as a freelance copywriter and social policy advisor for the local authority.